So I was reading a post from a guy that made rank 1 in a DD and he said your job is to spot and cap, not to engage in gunfights unless necessary so as to stay concealed. I tried this approach and have been experimenting with his advice but it feels like you really get the shaft by doing this. Take my last game for example: I capped very quickly at the start and then went to spot for the team. 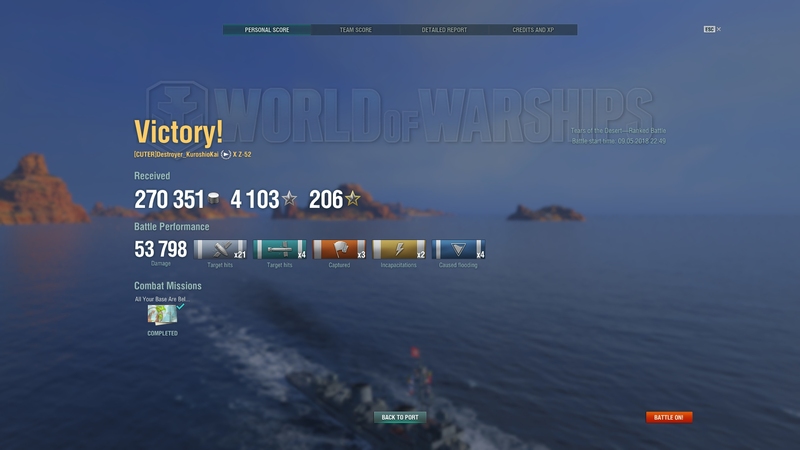 As the game progressed I ended up firing my guns to finish off a low health DD and then a low health Zao. I got the kill for both but only did 3800 damage in total. I got one cap ribbon, 3 defended, 1 fire, 2 kills. We ended up losing and I was second to last on the list. I didn't get any torp hits but they had a lot of radar and such. 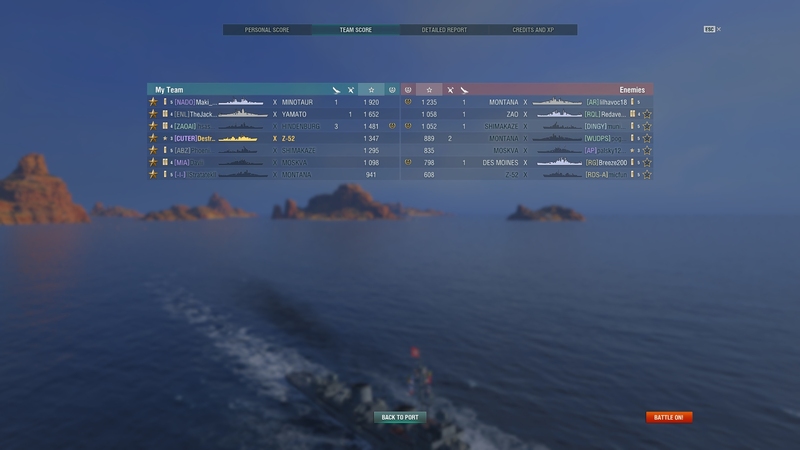 I did use my torps to deny the cap I got at the beginning and held it for the entire game but my team could not get the second cap. I threw torps multiple times and made a couple ships turn away from the cap as they spotted them but they never got hit so that doesn't really show on paper I guess. Meanwhile the BB that camped in the back and never moved got the #1 spot, I'm guessing he sniped all the way across the map a lot. I was busy so I couldnt watch him the whole time but people were griping because he wouldnt come help. Is there a better way to contribute as a DD?? Please enlighten me! looks like the enemy's DD did a better job securing and holding the vital 2nd cap. Cap control still wins games and DDs are best at it (and particular LoYang, Z-52, Yueyang). Good DDs can influence the game like no other class (perhaps with the exception of CV, but they are so rare). My thought is that advice is somewhat flawed. Primarily your goal should be to spot and cap, it's what destroyers are good at. However, don't be afraid to engage in fights that you can. You obviously did and got two kills but a low damage total. I think it's just a matter of balancing damage vs capping/spotting. As a non destroy main, though I do play them, I know I find it frustrating when I'm being spotted but none of the friendly destroyers are spotting for me. Not that they should play to risky but spot when you can as much as possible. I also get a little frustrated when friendly destroyers aren't attempting to kill enemy destroyers when they can. To go further, other Types are better equipped to "save" a star due to the damage they do. DDs play for the team win, and many other Types don't. If this newest patch fixes my issues with the game dropping me, there's a good chance I'll be able to play, and ill prolly switch to a fire spammer. I doubt I'll have to change anything on my Kut, and my Khab/others since they're already setup for random. Damage farming is damage farming. Unfortunately, I believe this season they've prioritized damage output over spotting, capping, etc. Thus, destroyers are rather handicapped compared to battleships and cruisers. WG is seeing this, and is prolly making plans for a change. My only worry is they'll do the normal and make a change TOTALLY opposite than the majority would like. Personally, I can see them taking away the ability to save a star instead of allowing other methods than damage. I have little faith in WG, but there's always hope. most seasons the DDs were kings of star saving, and some like the sims even get a higher multiplier for exp. so this season they are not the best at it....sounds like they are trying to balance a bit. I think they went over board. 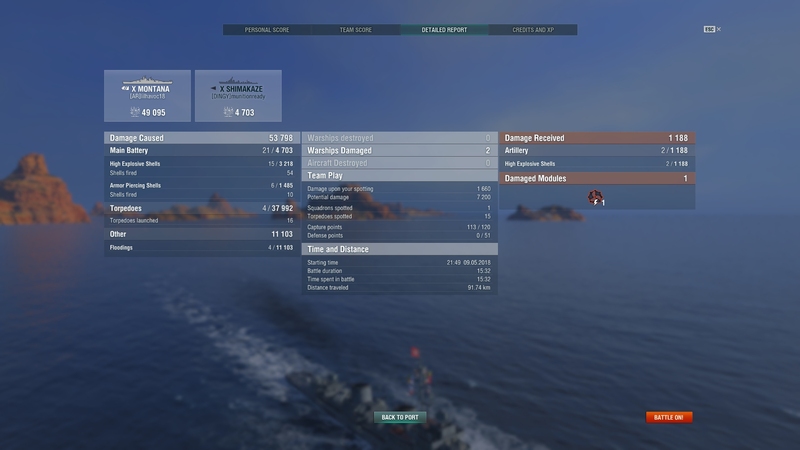 The damage while nothing special was still 51% for a T10 BB and 18% on a T10 DD, along with three full base caps. Capping XP has been crushed this season, especially caps beyond the first. There are so many playing the save a star game shooting 10- to 15km behind their friendly DDs, and just trying to farm damage at minimal risk to themselves (which is alright for CAs but BBs are letting their radar CA and DDs tank all the damage). This is even common in the rank 5 bracket. I hope WG gets rid of the save a star nonsense, and also drastically does away with safe ranks. As in no safe rank about like ranked 15. Let ranked battles be a test of peoples abilities and make it harder to fail your way to the top. DD's should always spot. They should cap when it's not suicidal. And, they should always looks for unfair engagements. In fact, this is your primary goal in ranked. Create engagements that are heavily weighted in your favor. In this meta, DD's are the composers of the orchestra who sometimes get to use that baton to smack around the reds. If you go into a match looking to farm damage, then you probably won't last long...and your team will hate you. The Base XP calculations haven’t changed for Ranked except that this is Tier 10. You get more XP for damaging 50% of the HP of a Tier 10 than for a Tier 8. However, I don’t think that the XP for capping changes between Tier 5 and Tier 10. Plus a kill counts as 15% of the victim’s HP, and Tier 10s have the most HP. I did fine in the Kidd through Rank 11. I switched to Conqueror after I figured out that none of my favorite T10 DDs were working well. Not so much to save a star as simply winning more. With all of the radar and focus fire, it’s really hard to play DD in Tier 10 Ranked. Remember, the DD is so super influential in game that no other ship comes close; sometimes I wonder why people play the other ships at all. Oh yeah, it's because even though the others aren't 'super influential' they get to fight (in what is a 'war' game) and are rewarded better for it. Let's recap: In this war game you have a ship type whose primary weapon has a 6-10% hit rate. If it hits, the damage can be reduced by half and then repaired with heals. Its role is soo influential, soo critical, soo vital and yet soo poorly rewarded for such an important role that WG has pigeon holed it into performing. I'm not even stating it should be rewarded better - just equally. Well that's balance! Actually, for ONE season. And yes, it was broken. Two solo caps and some damage and you'd get top spot. 3 solo caps and no damage, you'd still be number one. Of course, people complained and WG fell all over themselves as they often do when it comes to DD complaints, and way over compensated. For the last 3 or 4 seasons, DD capping XP has been trivial. Scouting XP has always been trivial. Yes, it's stupid and unbalanced. But it honestly is what it is. Ranked isn't inherently broken because of it. It's not the end of the world if it takes a herculean effort to be number one on a losing team. DDs are challenging to play in lots of ways in the current balance environment. But it's been like this for a while, and it's not like we're only allowed to play one ship per account. Those of us who continue to play DDs know what we're signing up for. And DD numbers are still high enough across the board, that I highly doubt WG sees DD issues as any kind of major problem.